I made part of one for an 80in - and having done it decided it was a job best avoided. I started with some S3 pipes - to provide the curves. The problem is not only getting the curves in the right place but holding the pipe at the exact angle while its welded, without crushing the pipe. That pipe had a 4 hole flange to the manifold - which I found was tricky to align. I eventually tacked that up with the pipe on the vehicle. People other than Britpart make exhausts. I use Bearmach which has always fitted nicely - and is sometimes cheaper than Britpart. Which lasts longer? Dunno. I'm beginning to wonder if the Solex carb on earlier S2/2A's burns exhausts more rapidly that the Zenith and possibly the Weber. Burlen Fuel Systems make diaphragms and other parts for the Solex. I've used their parts a number of times and they're good. I replaced the float chamber gasket on a Solex with a cheap one I purchased somewhere (not Burlen) and the choke wouldn't work at all. There was a hole missing in the gasket - Burlen gasket and it was fine. http://burlen.co.uk/ Look under Zenith Soles works nicely with new diaphragms and seems far less temperamental than the later Zenith. Its probably the only one that does anything. Originally one was for the ignition controlled accessories - and one for the interior light when fitted. has a pink wire! Does it have to be alloy? Could something that'll do the job be welded up from steel? Release bearing or something else???? 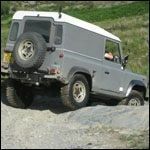 Could be release bearing - When I did my S3 i fitted a new bearing and assumed it was supplied greased and ready to go. Thing was noisy - so when I had the box out as I was far from happy with the change quality of the 1st/2nd synchro that I'd used I got another and filled it with spray grease - and it was quiet. The old one seemed to have traces of rust when I looked into it. Spiggot can make noises - and should be greased. Series 3 gearbox with 3031 stamped on case? In the interests of being helpful Land Rover decided that it would be best not to number S3 main gearboxes and to stamp the number on the top of the transfer box - where you show your number. As far as i know S3 numbers run like the vehicle numbers and begin 901 and run on to 902 when the 901's were exhausted. The important bit was the suffix letter as there are 4 types of S3 box. The original is suffix A - which suffered from a weak reverse. This was improved for suffix B, Suffix C introduced chemically machined teeth and suffix D had coffin-shaped engagement teeth. there's a bit more to it than this - all of which is shown in the parts manual. So apart from minor casting differences in the casing you can only tell them apaprt when you've dismantled the thing. I took one apart which from the transfer case seemed to be an 'A' but inside it was definitely a 'C'. What I did notice was the letter 'C' firmly stamped on the input shaft - under the seal housing. I don't know if this was co-incidence or a definitive marker of the type. Rover recon boxes usually have a plate screwed to the bellhousing stating what it is and the part no. (recon parts have their own number). Boxes supplied under warranty (ie when the customer expects a new box rather than a repaired one) may only have the suffix number stamped (I found one in a 2a with just a letter stamped. ) the idea was that the installer would stamp the original number on the box when he fitted it. The 3031 looks like a smaller font than Rover used so may not be a Rover stamping. Series one 80” V8, will a Auto Box fit ? I think Ashcroft used to do a kit - probably using a Borg Warner box. Yes they're different - inlet have springs - some exhaust don't. Exhaust are Viton - which has the lumps and rough bits so you can tell them apart. Specialised 2.5 N/A Glow Plug Advice Needed Please. I don't think you want to adjust the timing if its going well - but you may be able to cut down the maximim fuel a touch - some pumps have an external maximum fuel adjustment. Alternatively are you sure there are no air leaks or restrictions between the turbo and the engine? If you're thinking of planking it - then Keruing could be what you're looking for. Used for planking horse trailer floors and I think for planking on jettys. Described to me as "jungle mahogany." Isn't the stalk a standard S3 component - in which case I think it has a separate feed for the flasher. As you say the rest of the lights work this suggests that the fault is somewhere in the circuit form the switch to the lights. If its like the standard vehicle there are loads of bullet conectors behind the radiator grill - which corrode and fail. may be worth looking around there. The gasket face of the Rover IoE 4 and 6 cylinder engine is flat - the combustion chamber being in the partial hemisphere over the exhaust (side) valve and the adjacent side of the pointed piston. the Weslake head/manifold gets round Rover's inlet manifold cast in the head. Its a longitudinal tube with branches for each cylinder (bit like the manifold used on the 4 cylinder S1 engines). There's one carb for the 6 cylinders - I don't know if the end ones do much. Its claimed to produce more power than the Rover head. The compression ratio is controlled by the piston shape.